He was born Edward Santana White. But now, as an artist, just call him Edo. Edo’s bold and vibrant art reminds this old reporter of the 1960s artist Peter Max. But Edo’s never heard of him. He’s self-taught. As a kid he was always creating – turning refrigerator boxes in the alley into submarines – but he’s had little formal training. His dad, he says, is still addicted, and living on the street. He counts 12 foster homes in two years before his mom got clean. He went back to live with her at age nine. “But I was still angry and afraid of everything,” he says. But art, he says, saved him. “I just wanted to take all that hurt and all that pain and put it into something productive and art was that thing for me,” he said. It started with clothing. He created designs for shirts and hoodies, and a friend did the screen printing. Then digital art on his laptop. Then painting. And now he is doing it all. He and his partner run a small boutique called Project Escape at Boxville, a container mall in Chicago’s Bronzeville neighborhood. 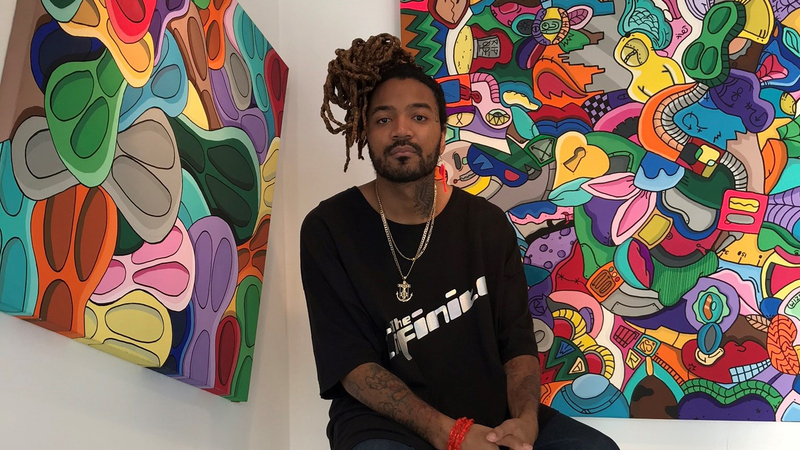 He showed his paintings at the prestigious show Art Basel Miami last month. And he is selling one-of-a-kind, hand-decorated sneakers, boots, pants and hats. Edo laughs and goes back to his painting. Note: This story was first published on Jan. 15, 2019.